I wanted to like Lord of Light and Shadow. I really did. I loved D.J. Conway’s Dancing with Dragons. I found it to be engaging and well-researched. So I was excited to receive a copy of Lord of Light and Shadow. I’m sad to say that I was disappointed. I was aware that this book would likely be more Wiccan-eqse then is normally my taste. But in a few places Conway seems to bend historical fact to fit her assumptions, and rarely provides sources. She says that Eros was originally Aphrodite’s consort! There is no evidence of that, and most Hellenic Pagans I know do not take kindly to that accusation. The book has some redeeming qualities. 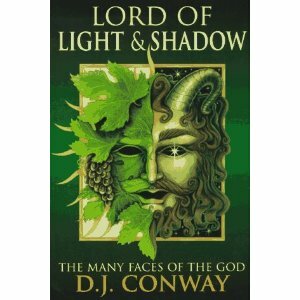 Conway sets out to explore the masculine side of the Divine from a Wiccan perspective. She divides the God into twelve archetypes, including the Child, the Magician, the Hero or Warrior, Lord of the Forest, the Sacrificed Savior and more. Experienced practitioners may glean some meaningful bits of theology from its pages, but I would not recommend this book for beginners. Its ideas are solid, but Conway is obviously a monist/soft polytheist and she blurs the distinct personalities of different Gods together. I admit I didn’t finish the book. It just got too fluffy for me. And, as I’m not a huge hardliner, I don’t say that often.